(affiliate link to Amazon) and was pleasantly surprised. It is a double darted pattern, which always works well with pear or hour-glass shapes with a high hip to waist ratio. For this version, I added in a back vent as I prefer this to the open split, this one a did as a closed pleated vent for something different and also added in a lining. When I do my pencil skirt linings I always include extra ease when cutting by increasing the seam allowances around the hip curve. 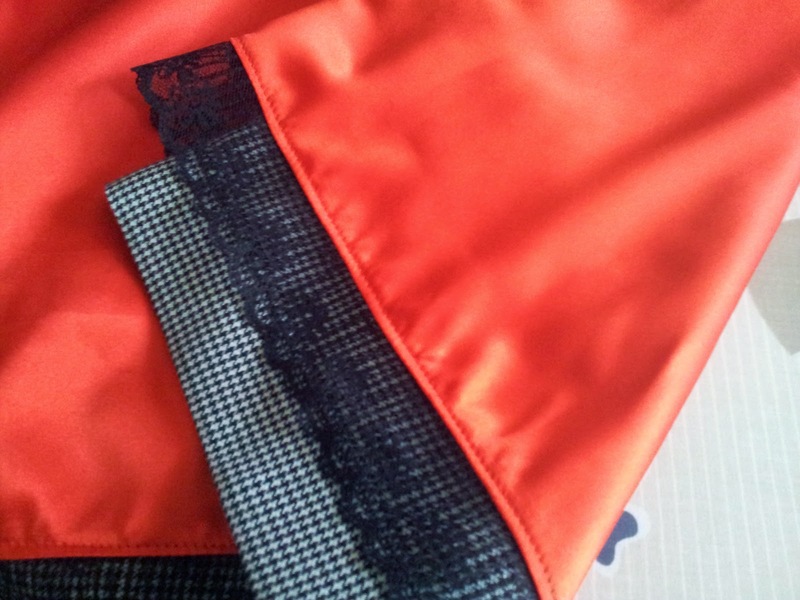 I read about it first when reading through the posts by Sunni regarding adding in a back vent and drafting a lining for pencil skirts and I really agree the extra ease really helps the lining to feel more comfortable. The fabric is from stash – a lovely tiny black and cream houndstooth wool inherited from my great aunt, and the lining is a red satin silk, part of my husband’s-business-trip-to-Vietnam fabric stash. I pegged in the sides a little more than drafted and lengthened it a little to below my knee. I also lowered the height of the curved front of the waistband to suit my proportions slightly better so it doesn’t not sit as high here as the pattern. I did add in the boning according to Gertie’s instructions (I used the rigilene sew-in kind not the stainless steel kind) and I love the structure and shape this gives the waistband. I am very happy with the hand picked zip. I made sure each of my stitches in black thread sat in one of the black houndstooth squares, which make the stitches completely invisible. If you can stand to stare at the houndstooth pattern close up (it makes my eyes go funny if I look at it too long, which made the hand sewing a really trippy experience), here is a close up of the lapped zipper. Mmmmm. hand picked lapped zipper. I really understand why this method is so popular – it is a lovely finish and makes pattern matching a breeze. The skirt is a tad wrinkled in the pictures as I had been wearing it for several hours when I managed to get a minute to take these pictures, but I notice my boned waistband is still sitting really nicely. I will be incorporating this technique into future waistbands for sure. And here is the best shot of the back of the skirt showing the vent, although it is a bit wrinkled from sitting in the car in it…. And some fun shots of the insides, which make this skirt feel lovely to wear…. This fabric frayed like crazy, so all the seams are serged. 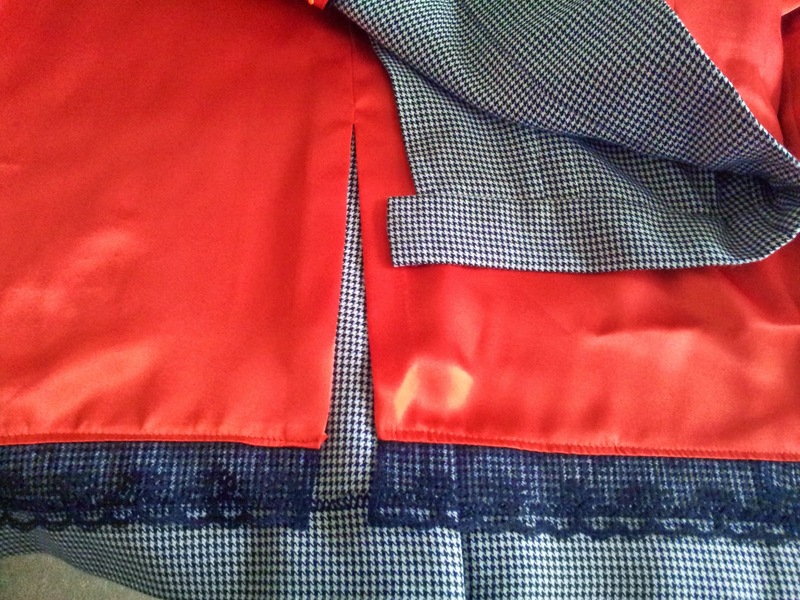 The hem and waistband facing are both slip-stitched by hand. My comment on the pattern is I love it, it works beautifully for my shape (currently 29″ waist, 40.5″ hip). It is drafted snug though so if you are between sizes make sure you cut up a size not down. I am between a 6 and an 8 and if I had cut a straight 6 it definitely would have been too small.